Sochi's average temperature: It was the warmest Winter Olympics ever. Another cold day during the Winter Olympics in Sochi. Move over, Vancouver: there’s a new gold medal holder for warmest winter Olympics in history. Now, to be fair, Sochi had a head start. It has the warmest average climate of any winter Olympics venue in history. 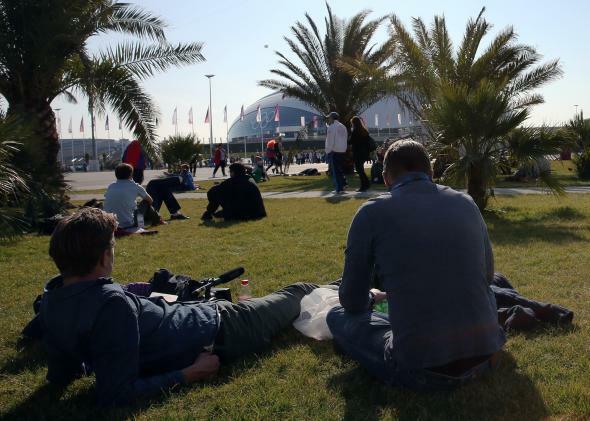 But it was even warmer than normal this month in southern Russia: The highest temperature recorded during the games was a whopping 68 degrees Fahrenheit. Six days were in the 60s. Here are the historical and actual temperatures for U.S. cities with a similar climate as Sochi, plus the averages. As it turned out, not one moment of the Sochi Olympics was below freezing, as measured in Adler, Russia, 17 miles away (and at the same altitude). That’s never happened before. So have the Winter Olympics warmed? I suppose that depends on what definition you want to use. In the sense that the International Olympic Committee (IOC) has awarded the last three consecutive games to three of the four climatologically warmest sites in Winter Olympics history, then yes, they’ve warmed, and certainly in recent years, the actual temperatures have warmed too. Should this be a surprise? Maybe, maybe not. The anomalies relative to normal haven’t been terribly impressive in recent years, but if the Sochi forecast verifies that will change a bit. Turns out, we’d probably have done better if the Olympics had been in Atlanta.